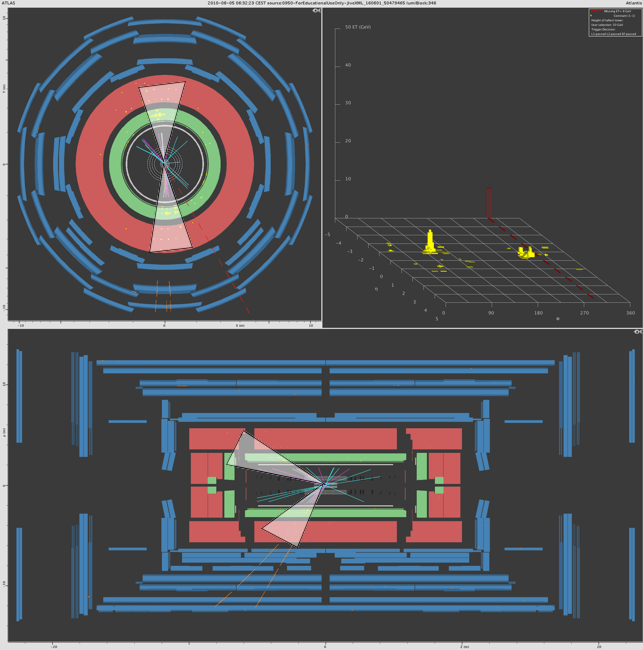 To analyse the proton-proton collisions that the program displays, you have to know how you can identify electrons (as well as positrons), muons (and anti-muons), neutrinos, and hadronic particles and jets using the event display. The photo gallery will show you how identifying particles works. 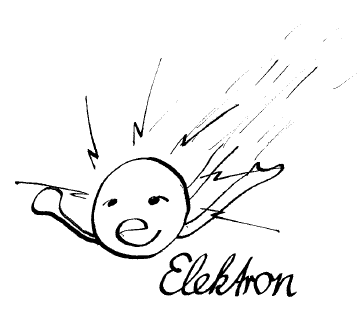 This signature is generated by an electron. 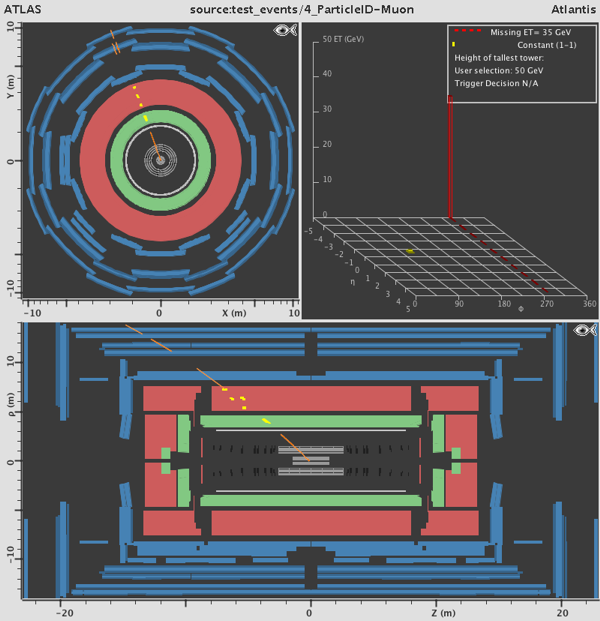 The particle has left a track (red) in the inner detector (therefore it carries electric charge) and has released all its energy within the electromagnetic calorimeter since it is the only one in which you can find deposits. This can be seen from the little yellow boxes inside the light-green structures that represent the electromagnetic calorimeter. Since there are neither entries in the hadronic calorimeter nor the muon chambers it is an electron or positron. The same event in the end view. 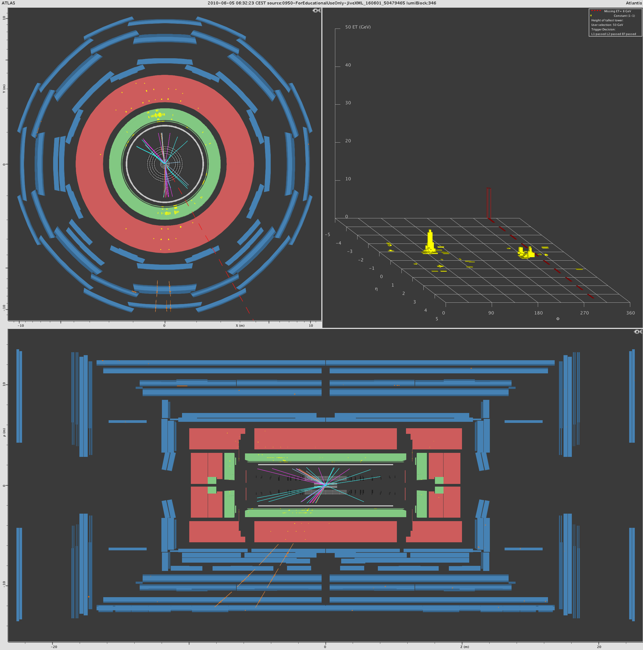 The track through all three inner detectors and the little yellow boxes depicting the deposits in the electromagnetic calorimeter can be easily recognised. The side view shows the same. If you combine both the side and end view you will get a spatial impression of the event. This is excellent training for your mind. How can you decide whether it is an electron or a positron? In the toolbar of MINERVA you find a hand with a pointed index finger (red frame). By clicking on this option you can choose a track in the event display (again by clicking on it). You will then see information displayed in the lower-right window. This information contains, for example, measured values of space-dependent components of the momentum (Px, Py, Pz) and the transverse momentum (PT). In the following picture you see the information of this window for the selected track. This is the info display for the selected track. The first three variables give the transverse momentum (pT), the pseudo-rapidity η and the azimuthal angle φ. The latter two variables give information about the direction of flight of the particle. The next triple of variables (Px, Py, Pz) represents the same information but in cartesian coordinates. 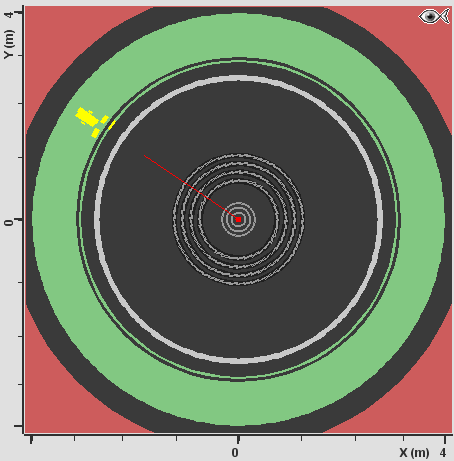 Next is the electric charge of the particle belonging to the selected track (Charge: here -1). “-1” means that the particle is electrically negatively charged. “1” means the opposite: electrically positively charged. We can identify our chosen particle as electron. The last bit of information is the isolation. It is a measure of how well the selected track is isolated from the rest of the event. A value of 0 means that no other tracks are in the vicinity of the selected track and that it is very well isolated. Usual values for well isolated tracks range from 0 to 0.3. 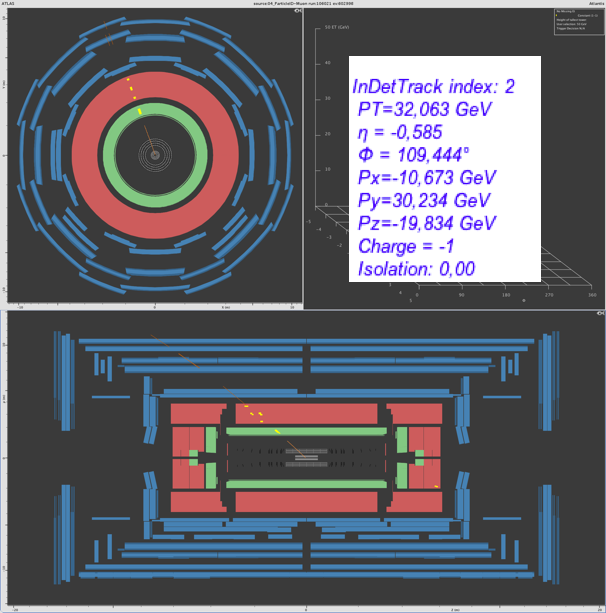 In this event display one sees a track (orange) in the inner detector, small energy depositions in both the electromagnetic as well the hadronic calorimeter (both displayed by little yellow boxes inside the light-green and red structures), and small tracks (orange) in the muon chambers. 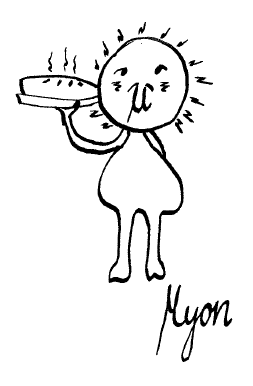 It is a muon (or an anti-muon), the only particle that goes through the whole detector and thereby leaves signals in all shells. In this enlarged view, you can see the orange tracks in the muon chambers very clearly. 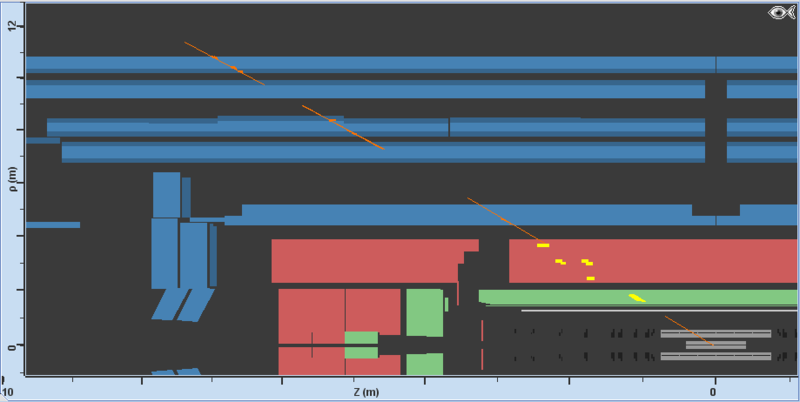 In the side view, the individual entries in the muon chambers are represented as orange crosses. All of the crosses inside one chamber are connected by an orange line, which symbolizes the track of the muon in this chamber. 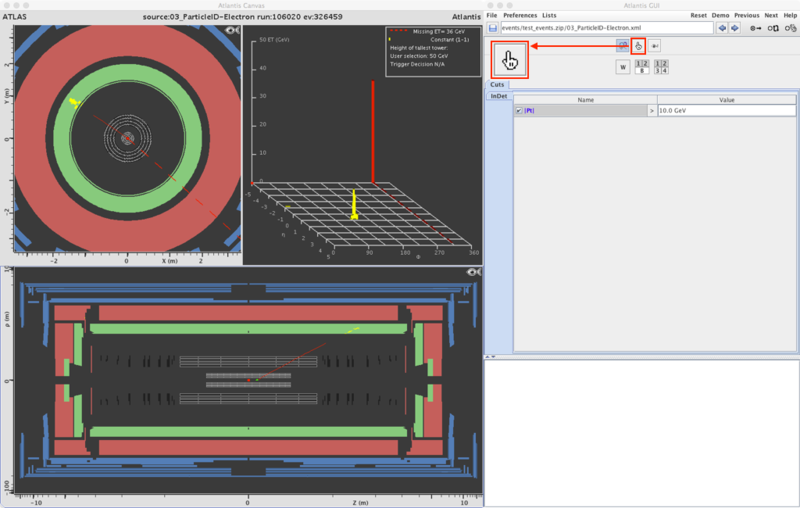 Connecting all orange tracks in mind will show you the path of the muon through the outer layers of the ATLAS detector. Muon or anti-muon? 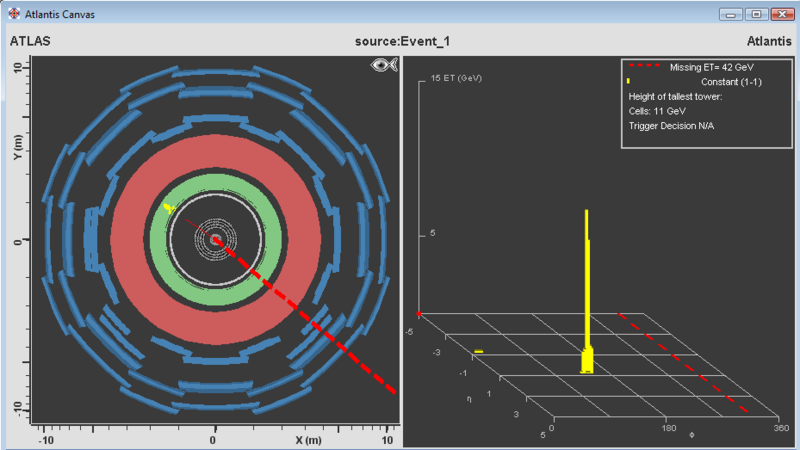 The same procedure that we described in the electron/positron section provides the result: In this event display, a muon is pictured (charge: -1). How does one recognize a neutrino? Neutrinos don't interact with even a single component of the ATLAS detector. They neither interact with the tracking detector, nor the calorimeters, nor the muon chambers. How can one therefore detect something what one cannot see? Since all quarks and gluons move along the beam axis before the proton-proton collision all of their velocity components at right angles to the beam (perpendicular) and therefore the so called total transverse momentum is zero. Due to momentum conservation the total transverse momentum (the vectorial sum of the transverse momenta of all particles) has to be zero after the collision as well. If the measurements contradict this, it is assumed that particles carrying transverse momentum leave ATLAS without being detected (e.g. one or more neutrinos which have (in sum) exactly this missing transverse momentum). 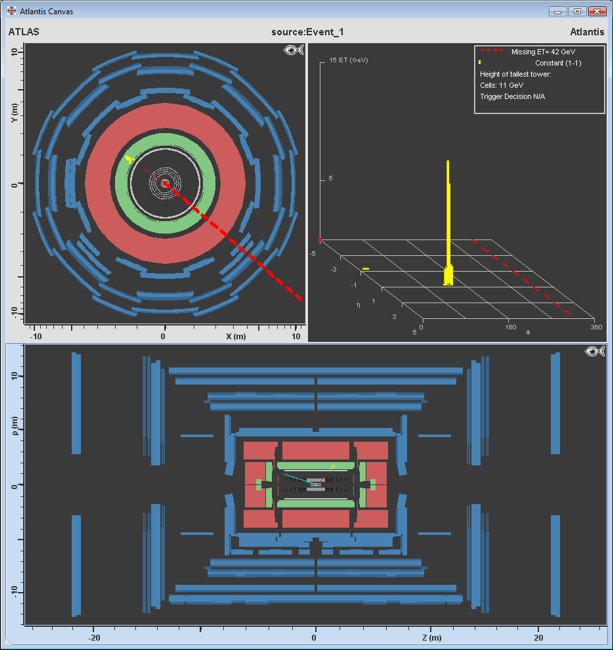 In the ATLAS detector, the missing transverse momentum is determined by the energy deposited in the calorimeters. When there is an imbalance within this energy distribution – which is called missing transverse momentum – this suggests a neutrino which was produced during the collision. 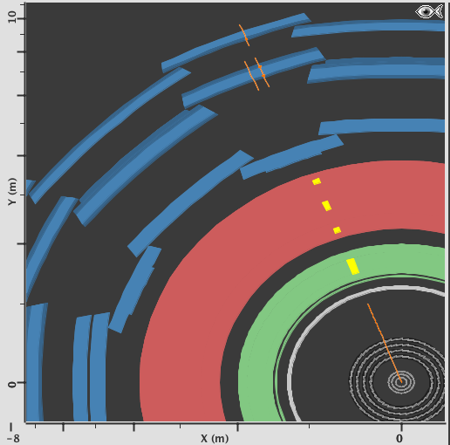 There are two ways that this is shown with MINERVA: The missing transverse momentum value is displayed in the lego plot (upper right, look for Missing ET) and a red dashed line is depicted in end view. This line depicts the direction of the energy imbalance. The thickness of the line is a measure for the value of the missing transverse momentum. 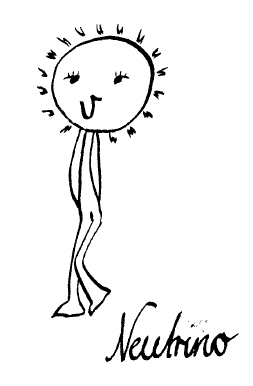 In this event, an electron and a neutrino were produced nearly exclusively. Since these two particles are kind of the only ones that have been produced the total transverse momentum is split between these two due to the conservation of momentum. That is why the neutrino with its share of the transverse momentum flies away from the electron in the nearly opposite direction. The related missing momentum can be read off the lego plot or by clicking on the dashed line. The thickness of the dashed red line indicates the existence of one or more invisible particles, e.g. neutrinos. Smaller missing transverse momenta of about 10-20 GeV (thin red dashed lines) may be caused by measurement uncertainties of the detector. In this event display so called jets are shown. Each jet consists of a bundle of several particles. The electrically charged particles cause tracks in the inner detector whereas the neutral ones don't. If you extrapolate the tracks you will find many entries in the calorimeters. Other depositions nearby cannot be assigned to a track because they were caused by electrically neutral particles. Especially the hadronic calorimeter contains many entries. This can be explained by the way jets form. Every jet is the result of a gluon, quark, or antiquark that is ejected from the proton during the collision. Big amounts of energy are at work in order to overcome the huge binding forces holding the gluons and (anti-)quarks in the proton together. 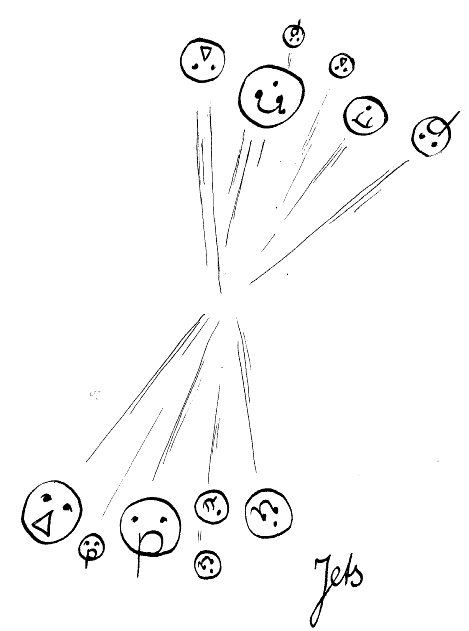 A part of this energy is used to create new quark-antiquark pairs which move in the approximately same direction and bind each other to form new particles – so called hadrons. These hadrons constitute the jets that are shown as grey cones in this picture to make the easily recognisable. 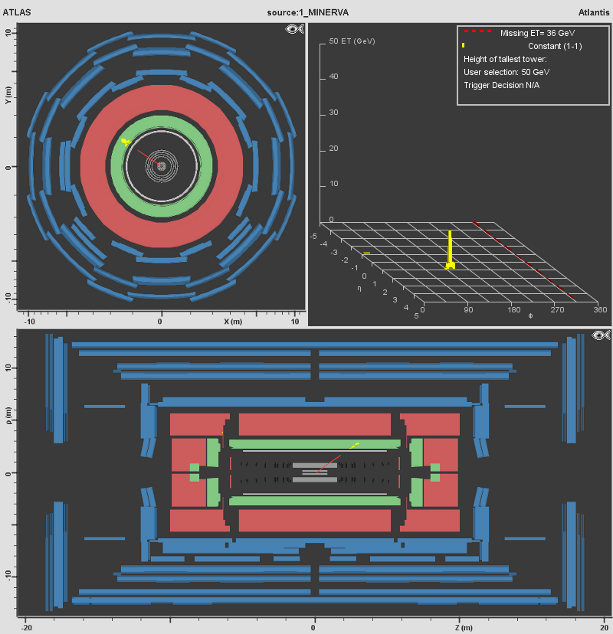 Keep in mind: Particles that fan out, cause tracks in the inner detector and have entries in the electromagnetic and especially the hadronic calorimeter can be put down to quarks, antiquarks, and gluons, and are called jets.